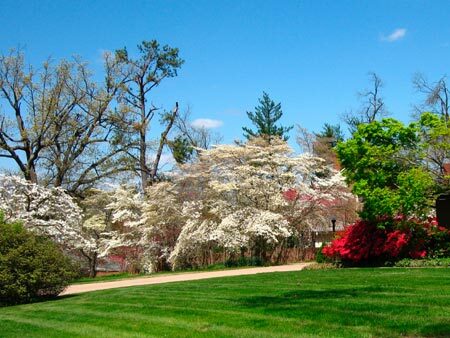 In 2009, we arrived early for the annual AQS Quilt Show & Contest so we could tour Paducah's Dogwood Trail. Generally the dogwood bloom peaks around April 15th and lasts into the early part of the Quilt Show. While the dogwoods were in bloom, the display was compromised by a January ice storm that ravaged the middle west across northern Arkansas, southern Missouri and Kentucky. The ice storm beheaded perhaps hundreds of thousands of trees. In April, as we traveled from northern Arkansas and east into Kentucky, downed trees and branches littered the roadside and distant hills and mountains appeared as if they had received a severe butch haircut! The damage in Paducah wasn't as extensive as in Arkansas, yet was still significant. The dogwoods were blooming, although you could see many trees were missing branches. Still attractive, even though their display was a subdued version of their former selves. Because a number of streets normally part of the Paducah Dogwood Trail were still undergoing cleanup, with dangerous hanging branches and brush piles stacked in the roadway, the Chamber elected to cancel the 2009 Dogwood Trail exhibition. However since we had trail maps from previous years, we toured some of the areas where the cleanup had been completed. The photographs below are from our informal tour. We fully expect the official Dogwood Trail celebration to resume and with new growth replacing the damage, the display should return to its former brilliance. On the official opening day, there will be a reception and complimentary tour hosted by Paducah Ambassadors and the Paducah Bus system. 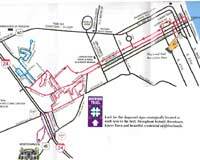 < < < Here's a map of the Dogwood Trail from the previous year showing the trail and other points of interest. Visit our Paducah Links section for Paducah's current events schedule and related information. < < < The First Baptist Church on Broadway Avenue. On another street, Red buds and Azaleas complement the Dogwoods. Dogwood & Azaleas in bloom. 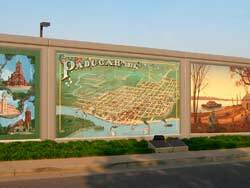 Not to be missed in a visit to Paducah is the 3 block long floodwall with 45 murals of historical vignettes ("Wall to Wall - Portraits of our Past"). Go Here to see more of Paducah's Floodwall Murals and historical notes on each of them. Nearby Grand Rivers, Kentucky . . .